Just so there is no confusion, I want to go ahead and let the reader know the racing driver vision test has nothing to do with the racecar eye chart. That’s just a fun illustration we made for the article. Several months ago, I was working with a driver who felt they had hit a plateau with their performance at Road America. During the session, they said they always had trouble with the first two 90 degree corners. I mentioned offhandedly that the corners were actually a bit over and under 90 degrees. They replied with surprise remarking that they didn’t realize that. This made me think we might have found the root of the problem so I showed them the two images below which are featureless, but accurate representations of the two corners in question. They weren’t able to tell which was which. We use the term Line Theory for the physics-based set of rules a driver can use to work toward an ideal line on a racetrack. This is great for those drivers who have hit their wall or at least have a few events under their belt and can get around a track somewhat competently. It allows a driver to slowly chip away at their mistakes as they reach ever closer toward their ultimate potential. Myths spread because, on the surface, they often seem to make sense. The racing world most likely has so many of these myths because not only are they often born from good basic advice, but also because of the massive influence driving skill has on lap times. A suboptimal racing line driven perfectly will almost always beat an ideal racing line driven poorly. This has allowed some of these less than ideal techniques to evolve into supposed truths that are in fact, not. I spend a good deal of time helping drivers unlearn these "truths," so in this article I'll go over the five big ones that you hear repeated over and over. Hopefully this will help some newer drivers skip the unlearning part and go straight to the learning. ​This is a follow-up to our previous article about reducing motion sickness in sim-racing titles. The topic of whether or not the view should be locked to the horizon in sim-racing titles was hotly debated when it was first introduced years ago and this sim-racing civil war has not in any way subsided. We wanted to write this follow-up to shed some more light on the subject and hopefully bring about a ceasefire. We'll first go a little more in-depth into the the science and then talk about the pros and cons of horizon locking as well as how each individual might want to use it. 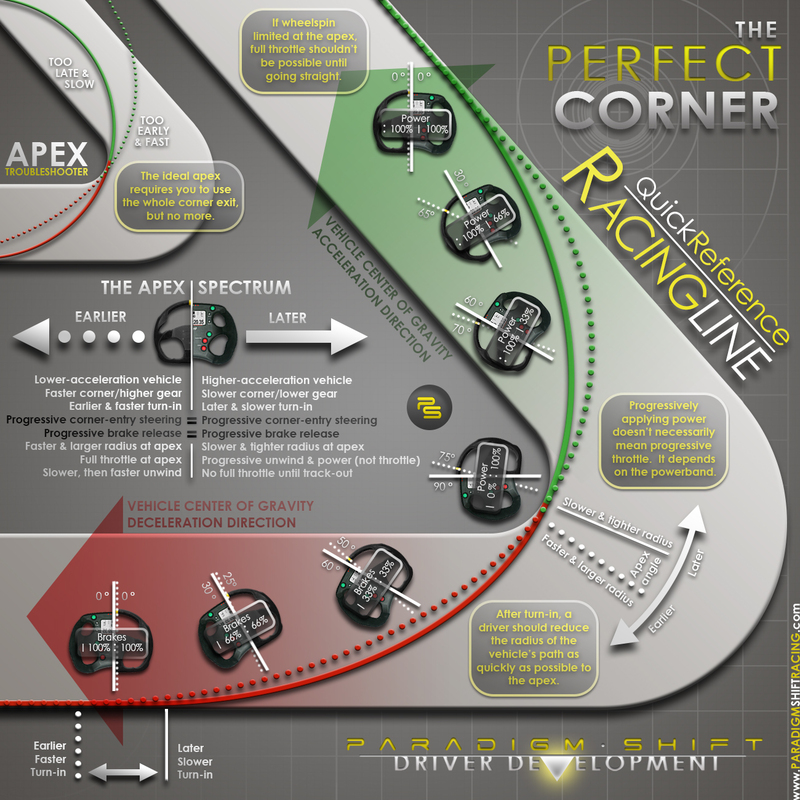 We've put together a quick-reference infographic of the racing line covering the whole apex spectrum. From the lowest-acceleration early apex to the fastest late apex. Virtually every vehicle would ideally travel somewhere between these two lines. The graphic covers everything from turn-in points and apex angles to the appropriate steering, throttle, and braking needed along the continuum of apexes. You'll learn what kinds of corners and cars need earlier and later apexes as well as the key differences as your apex angle moves along the inside of the track. See how cars capable of high-acceleration in a corner need a later, slower turn-in and a slower, tighter radius to more effectively use their power during corner exit. Head instructor and author Adam Brouillard takes you through a lap of Lime Rock Park in the iRacing Global Mazda MX-5 Cup car. Seemingly simple, but surprisingly complex, kart racing is as full of secrecy as it is misunderstanding. This leaves many curious karters searching for real answers. We don't much like secrecy or misunderstanding so in this two-part article we will look at the unique considerations of karts. Even if you aren't the solid-axle sort however, learning about karts can teach you a lot about the more "advanced" racing classes. We have some upcoming articles where a basic knowledge of how tires work will be needed so we've put together a brief overview. Tire science is incredibly complex, but there are certain aspects that can be quite important for a racing driver to understand. In this article, we will go over load sensitivity, slip angle and induced drag, as well as slip ratio. 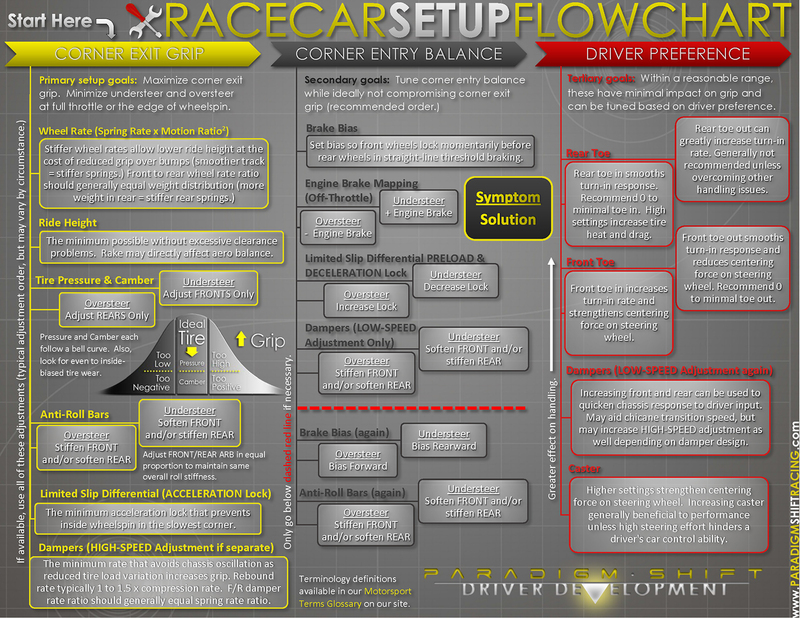 As a supplement to our Racecar Setup Guide, we've created a flowchart to give those newer to car setup a starting game plan to follow. This chart represents a good basic setup philosophy that covers the primary elements that affect vehicle handling and performance. It will give a driver something to build on and tailor to their own needs as their vehicle dynamics knowledge expands. This flowchart shows a balance-based approach where no advanced telemetry or tools will be needed. A driver will primarily use their ability to detect understeer and oversteer to work toward a good setup. This is an approach that will grow with driver skill and as you become more sensitive to car balance, you will be able to hone in on a better and better setup. Racing Sims' DEFAULT SETTINGS CAN CAUSE VR SICKNESS & HOW TO FIX IT. Note: We have created a follow-up article with more info about the pros, cons, etc... here. We're big advocates of sim racing as a motorsport in its own right and also as a great training tool for real world competitors. For many racers, virtual reality has brought sim-racing to a whole new level and you hear many stories of elation from drivers after donning a VR headset for the first time and experiencing the cockpit of their favorite exotic sportscar as if they are really there. For some however, that elation is short lived once they pull out onto the track and the first few corners make them start to wonder if they might be seeing their lunch again soon.